ST. LOUIS – Students, faculty and staff are invited to sign the last steel beam that will be bolted into place on the Interdisciplinary Science Building (ISB), marking a key milestone in the construction of the project. The beam signing and placement– called a “topping out” ceremony –is scheduled for 9:30 a.m. to 10:30 a.m. Oct. 14 at the Mary Ann Lee Plaza on the home campus in Webster Groves. The beam will be set out at 7:30 a.m. and can be signed until 9:30 a.m.
After the ceremony, construction workers will be offered a mid-morning snack to show appreciation for their speedy work on the project. The next phase of the ISB construction will be to install the building enclosure systems – the “skin” of the building. The ISB is scheduled to be completed before the start of the 2017 fall semester. “One year ago, we broke ground for this project, and by this time next year, we will host a grand opening for Webster students, faculty, and staff and the community. This topping out ceremony marks a key point in the construction process, a moment to celebrate this milestone of progress.” said Webster University President Elizabeth (Beth) J. Stroble. “Through this ceremony we express appreciation to everyone who has helped with this project, from the students, faculty, staff and design team members who programmed and designed this project, to all who are raising the ISB from the earth." The practice of "topping out" a new building can be traced to ancient Scandinavian ceremonies. Originally, builders would place a tree on top of a new building to appease the spirits that may have been displaced by the construction process. Afterward, a toast or a meal would be offered to the workers. This tradition has been adopted by other cultures around the world, including The Masons, who host similar ritualistic cornerstone laying ceremonies. At Webster’s ceremony, Board Chair Amelia Bond, President Stroble, Provost Schuster, College of Arts & Sciences co-Deans Jennifer Broeder and Joseph Simpfl, and Student Government Association President C. Wiley will deliver brief remarks. Members of the audience and the construction workers will be invited to sign the final steel beam, which will be on display. Construction workers will then be offered a mid-morning snack as a sign of appreciation from the Webster University community. Construction of the 87,866-square-foot building is expected to be completed in summer of 2017. When completed, the building will help fill the needs of the community by offering robust STEM programs. Several studies over the years have forecasted a dramatic increase in jobs in the region that require employees to have STEM-related preparation. 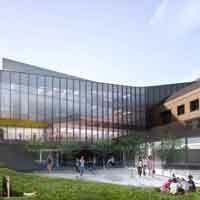 The building will house the departments of Anthropology and Sociology, Biological Sciences, International Language and Cultures, Nurse Anesthesia, Nursing, Psychology and the Institute of Human Rights. Overall, the ISB will include 27 laboratories, 3 general classrooms, 51 faculty offices (with six for adjunct faculty), 20 staff offices, and a 129-seat auditorium. There also will be commons areas throughout the building for students and faculty to collaborate and hold study sessions. As part of the construction, the parking garage also is being expanded. That work has already begun and is anticipated to be completed in spring of 2017. That project will more than double the amount of parking in the garage, resulting in an overall net gain of more than 550 parking spaces to the home campus. With its home campus in St. Louis, Missouri, USA, Webster University (www.webster.edu) comprises an action-oriented global network of faculty, staff, students and alumni who forge powerful bonds with each other and with their communities around the globe. Founded in 1915, Webster is a private non-profit university with more than 17,000 students studying at campus locations in North America, Europe, Asia and Africa and in a robust learning environment online. The university is committed to delivering high-quality learning experiences that transform students for global citizenship and individual excellence.